If you are a UCC student, you can ride the bus for a very low cost. 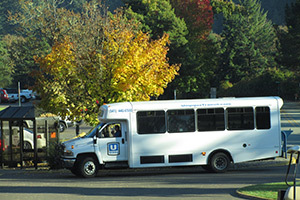 Student passes are available for just $50 per term from Umpqua Transit. The passes can be purchased from the UCC Accounting Specialist in the Student Center. The pass is good throughout the Umpqua Transit system, five days a week. Buses pick up and deliver daily to the UCC campus. The bus stop is located between Jacoby Auditorium and the Administration Building. Bus schedules are available in the Campus Center Building. Student! Need financial help with the cost of a Bus Pass? Apply for a subsidized pass through ASUCC Student Services. For the latest online bus schedules, visit the Umpqua Transit website. For more information, call Umpqua Transit at 541-440-6500.